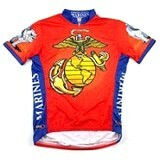 Pro series U.S. Marines Team Men's Cycling Shorts (PWS34M). Closeout...Reg $84.95. You save $34.95! Price: $84.95 Sale $50.00 ! !